Looking for a fixture that can give you super cool white, comfy warm white, or even ultra deep amber? You'll get that plus tons more with the HotBox™ InfiniWhite! Solidly built, and cute as a button; this tiny little fixture (approximately 5 inches square) can throw out a wide range of beautifully mixed bright colors (2700k-6500k) with its 7x5W Amber/Cool/Warm white 3-in-1 LEDs, while drawing a maximum of just 40W of power. An easy to use 4-button LED control panel can be found on the back of the HotBox™ InfiniWhite that gives users direct access to all the features and settings such as 0-100% A/C/W intensity, strobe, built-in programs, auto mode, and sound active mode. It also features a flicker-free constant-current 400hz LED driver and five separate user selectable 32-bit dimming curves which can be individually selected through the control panel or accessed directly via DMX. These five different dimming curves allow for different amounts of steps for much smoother (and slower) dimming capabilities. 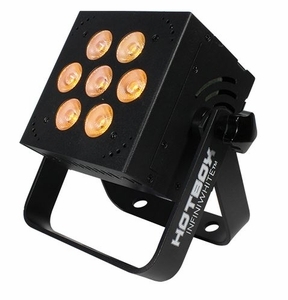 HotBox™ InfiniWhite can be controlled via DMX using either 3/6/7 or 8-channels channels of DMX. This incredible LED fixture also comes equipped with dual hanging brackets with locking knobs for secure mounting, plus industry standard 3-pin DMX input/output connections and powerCON® compatible power input/output to daisy chain the DMX signal and power to multiple fixtures with ease. And just like all of our HotBox™ LED fixtures, the rear connections are strategically placed in a recessed area on the back of the unit which will allow you to use the fixture in any position, including flat on the floor. And of course, it’s also backed by Blizzard's 2-year warranty.